Köppen climate classification types of North Carolina. There is an average of forty-five inches of rain a year (fifty in the mountains). July storms account for much of this precipitation. As much as 15% of the rainfall during the warm season in the Carolinas can be attributed to tropical cyclones. Mountains usually see some snow in the fall and winter. Moist winds from the southwest drop an average of 80 inches (2,000 mm) of precipitation on the western side of the mountains, while the northeast-facing slopes average less than half that amount. A downed tree in Asheville, North Carolina caused by snowfall from the 1993 Storm of the Century. Snow in North Carolina is seen on a regular basis in the mountains. North Carolina averages 5 inches (130 mm) of snow a year. However, this also varies greatly across the state. Along the coast, most areas register less than 2 inches (51 mm) per year while the state capital, Raleigh averages 7.5 inches (190 mm). Farther west in the Piedmont-Triad, the average grows to approximately 9 inches (230 mm). The Charlotte area averages approximately 6.5 inches (170 mm). The mountains in the west act as a barrier, preventing most snowstorms from entering the Piedmont. When snow does make it past the mountains, it is usually light and is seldom on the ground for more than two or three days. However, several storms have dropped 18 inches (460 mm) or more of snow within normally warm areas. The 1993 Storm of the Century that lasted from March 11 to March 15 affected locales from Canada to Central America, and brought a significant amount of snow to North Carolina. Newfound Gap received more than 36 inches (0.91 m) of snow with drifts more than 5 feet (1.5 m), while Mount Mitchell measured over 4 feet (1.2 m) of snow with drifts to 14 feet (4.3 m). Most of the northwestern part of the state received somewhere between 2 feet (0.61 m) an 3 feet (0.91 m) of snow. Another significant snowfall hit the Raleigh area in January 2000 when more than 20 inches (510 mm) of snow fell. There was also a heavy snowfall totaling 18 inches (460 mm) that hit the Wilmington just before Christmas in 1989, with little snow measured west of I-95. Most of the big snows that impact areas east of the mountains come from extratropical cyclones which approach from the south across Georgia and South Carolina and move offshore the Carolinas. If the storms track too far east, the snow will be limited to the eastern part of the state. If the cyclones travel close to the coast, warm air will get pulled into eastern North Carolina due to increasing flow off the milder Atlantic Ocean, bringing a rain/snow line well inland with heavy snow restricted to the piedmont. If the storm tracks inland into eastern North Carolina, the rain/snow line ranges between Raleigh and Greensboro. On October 15, 1954, Hurricane Hazel struck North Carolina, at that time it was a category 4 hurricane within the Saffir-Simpson Hurricane Scale. Hazel caused significant damage due to its strong winds. A weather station at Oak Island reported maximum sustained winds of 140 miles per hour (230 km/h), while in Raleigh winds of 90 miles per hour (140 km/h) were measured. The hurricane caused 19 deaths and significant destruction. One person at Long Beach claimed that "of the 357 buildings that existed in the town, 352 were totally destroyed and the other five damaged". Hazel was described as "the most destructive storm in the history of North Carolina" in a 1989 report. 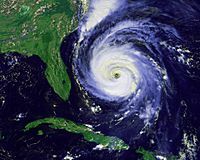 In 1996, Hurricane Fran made landfall in North Carolina. As a category 3 hurricane, Fran caused a great deal of damage, mainly through winds. Fran's maximum sustained wind speeds were 115 miles per hour (185 km/h), while North Carolina's coast saw surges of 8 feet (2.4 m) to 12 feet (3.7 m) above sea level. The amount of damage caused by Fran ranged from $1.275 to $2 billion in North Carolina. Heavy rains accompany tropical cyclones and their remnants which move northeast from the Gulf of Mexico coastline, as well as inland from the western subtropical Atlantic ocean. Over the past 30 years, the wettest tropical cyclone to strike the coastal plain was Hurricane Floyd of September 1999, which dropped over 24 inches (610 mm) of rainfall north of Southport. Unlike Hazel and Fran, the main force of destruction was from precipitation. Before Hurricane Floyd reached North Carolina, the state had already received large amounts of rain from Hurricane Dennis less than two weeks before Floyd. 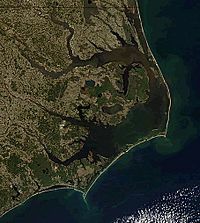 This saturated much of the Eastern North Carolina soil and allowed heavy rains from Hurricane Floyd to turn into floods. Over 35 people died from Floyd. In the mountains, Hurricane Frances of September 2004 was nearly as wet, bringing over 23 inches (580 mm) of rainfall to Mount Mitchell. Tornado activity in the United States. In most years, the greatest weather-related economic loss incurred in North Carolina is due to severe weather spawned by summer thunderstorms. These storms affect limited areas, with their hail and wind accounting for an average annual loss of over US$5 million. In winter, North Carolina is protected by the Appalachian Mountains on the western front. Cold fronts from Canada and the Gulf of Mexico rarely make it past the towering mountains. Cold winds make it across the peaks once or twice a year and force the temperatures to drop to about 10 °F (−12 °C) in central North Carolina. Although temperatures below zero degrees Fahrenheit are extremely rare outside of the mountains. The coldest ever recorded temperature in North Carolina was −34 °F (−37 °C) on January 21, 1985, at Mount Mitchell. The winter temperatures on the coast are mostly due to the Atlantic Ocean and the Gulf Stream. The average ocean temperature in Southport in January is still higher than the average ocean temperature in Maine during July. Snow is common in the mountains, although many ski resorts use snowmaking equipment to make sure there is always snow on their land. North Carolina's relative humidity is highest in the winter. Tornadoes are most likely early in the spring. The month of May experiences the greatest rise in temperatures. 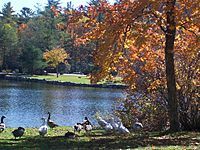 During the spring, there are warm days and cool nights in the piedmont. Temperatures are somewhat cooler in the mountains and warmer, particularly at night, near the coast. North Carolina's humidity is lowest in the Spring. Harris Lake in Highlands, North Carolina during Fall. North Carolina experiences high summer temperatures. Sometimes, cool, dry air from the north will invade North Carolina for brief periods of time, with temperatures quickly rebounding. It remains colder at high elevations, with the average summer temperature in Mount Mitchell lying at 68 °F (20 °C). Morning temperatures are on average 20 °F (12 °C) lower than afternoon temperatures, except along the Atlantic Coast. The largest economic loss from severe weather in North Carolina is due to severe thunderstorms in the summer, although they usually only hit small areas. Tropical cyclones can impact the state during the summer as well. Fogs are also frequent in the summer. Fall is the most rapidly changing season temperature wise, especially in October and November. Tropical cyclones remain a threat until late in the season. The Appalachian Mountains are frequently visited at this time of year, due to the leaves changing color in the trees. The water on North Carolina's shores have risen 2 inches (50 mm) but the reason is heavily discussed. Temperatures in North Carolina have risen too. Over the last 100 years, the average temperature in Chapel Hill has gone up 1.2 °F (0.7 °C) and precipitation in some parts of the state has increased by 5 percent. Climate of North Carolina Facts for Kids. Kiddle Encyclopedia.